THE Gladstone Wastewater Treatment Plant is set to receive a $7.6 million upgrade as part of the Building Our Regions funding announcements made by the State Government yesterday. The State Government will cough up just over $3 million for the project, with the rest to be covered by the Gladstone Regional Council. 100% of the effluent water produced by the plant is currently sold to QAL, while remaining "biosolids" can serve a variety of purposes such as fertilisation. The upgrades will boost the capacity of the plant to produce biosolids from wastewater at a rate of more than 20%. The plant's aging belt press is currently producing biosolids at a rate between 13% and 14%. The upgrades will also add the capacity for the plant to chemically stabilise its own biosolids on site, so the material can be shipped to commercial buyers directly from the plant. A new permanent waste transfer station at Agnes Water was also announced yesterday, to replace the existing temporary station. The projects are being funded under the State Government's $375 million Building Our Regions program. 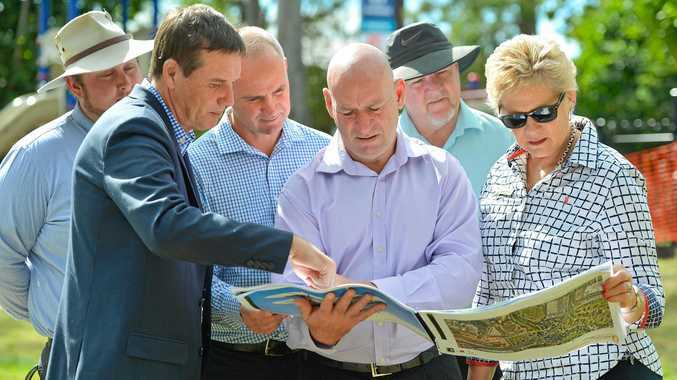 State Development Minister Anthony Lynham said communities "from Moura to Miriam Vale" were already benefiting from more than $7.5 million allocated to five projects across the region. "Infrastructure projects spark jobs growth and flow-on business opportunities, keeping regional Queensland's local economies ticking over and its communities strong," Dr Lynham said. Upgrades to fencing and runway lighting at Thangool Aerodrome and a disabled access ramp at the Biloela swimming pool were also announced, as well as an upgraded car park for Boyne Island State School. More than 30 jobs will be created by the five projects, according to State Government estimates.